Hindus believe in the sade teen (3 & 1/2) muhurat basically 4 days when it is considered especially auspicious to buy gold. Then we have Diwali, marriages and a host of other festivals, which keep the jewelers busy. So Kharidne walon ko kharidne ka bahana chahiye. It may be either in the form of coins or rings or in the form of jewelry. Does this buying really constitute investment? When we think of an investment portfolio we generally think in terms of buying at an opportune time and selling when the goal requirement arises or when there is adequate appreciation. Now try and apply this logic to your Gold purchase. Recently the Gold prices reached a high of 32000. Did you in all seriousness even think of selling your wife’s gold ornaments or the family Jewelry inherited from your parents at this time? Will you think of selling when your daughter is seeking admission into an overseas university for higher education, instead of taking a loan? Most of the Gold purchase ends up being a dead investment and does not make any contribution towards fulfillment of any of your financial goals except possibly gifting it to your daughter in marriage. If that is the aim by all means accumulate physical Gold to fulfill this requirement and no more. And while you are at it do not go overboard. Her happy married life is not linked to the amount of Gold you give her. Investment in Gold as part of an overall strategy is a different ball game altogether. Consider the Gold price chart above. The biggest jump in the prices in numerical terms happened in last 10 years from 2004 to 2014 and the appreciation per year was 19%. But nobody invests in Gold for 10 years, so lets look at the longer-term return. The 10 years prior to that the prices hardly moved. A 20-year period from the 80s till 2004 shows a 5% return. A 30 year period from the 80s to 2014 high, show a 9.6% return. The obvious conclusion is that Gold is a good hedge against inflation. Do not have greater expectations from it. Does that mean you should not invest in Gold? Not at all! During financial turmoil, it outperforms all other investment assets and hence reduces the overall volatility of the portfolio. Practically we can’t wait for the next crisis to turn up for our Gold investment to glitter, hence the need for diversification. A healthy and balanced portfolio will have growth assets like equity and real estate, steady assets like fixed income and debt investments and Gold to add further balance. How much percentage of each asset class in the portfolio? That depends on each individual’s profile. In its latest Gold Investor report, World Gold Council’s Marcus Grubb, Managing Director – Investment Strategy and Juan Carlos Artigas, Director – Investment Research state, Our research shows that a 5%-6% allocation to gold is optimal for investors with a well-balanced medium-risk portfolio (a 60/40 portfolio in equities, cash and bonds). If you have a demat account, you can buy gold in paper form on the stock exchange. One can purchase gold in multiples of 1 unit. 1 Unit = 1 gram of gold. (A few fund houses also trade in gram gold as one unit.) The price of unit of one gram gold follows the market price of 24 carat gold. Safety & Storage: Since there is no physical gold involved, it is a safer avenue for investment in gold. So there is no question of storage as well. Less expensive: No making charges or locker charges are applicable in case of ETFs. Affordability: Gold can be bought in as small quantity as 1 gram. Purity: ETFs guarantee purity of gold, usually 99.5%. Wealth Tax: Gold ETFs do not attract any wealth tax liability. 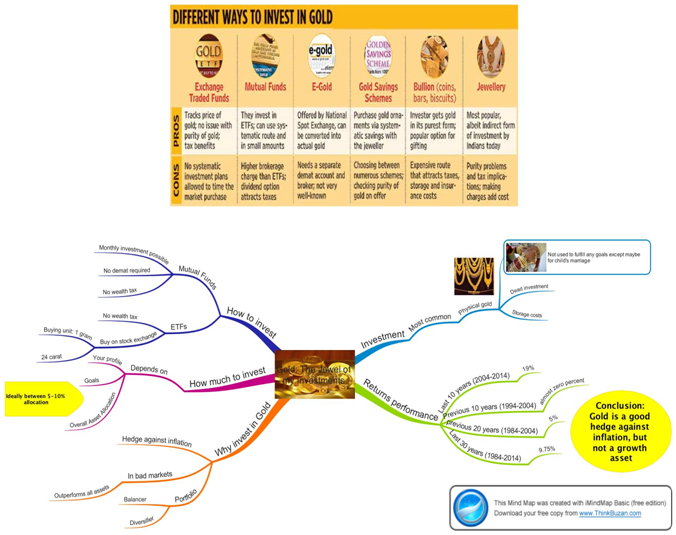 Investing in gold mutual funds is like investing in any other actively managed mutual fund. It is useful for investors who do not have a Demat account. Ease of Operation: No Demat a/c is required. Safety & Security: Since no physical gold is involved it is safer to invest in gold mutual funds. Less expensive: No making charges or locker charges are applicable. Redemption Process: On redemption, the amount of funds will be dependent on the closing NAV of the fund. Wealth Tax: Gold Mutual Funds do not attract any wealth tax liability.